Cooking is like a portal: it allows you to step into someone’s world and physically experience their tastes, culture, and traditions even if they are on the other side of the planet, without leaving your kitchen. But for this to work correctly, the recipe (which is the spell that opens the portal) has to accurately and completely list the ingredients and procedure – and this is where many recipes fail, even recipes from famous chefs. This blog is my attempt to rectify this: here, you will find my tested and standardised recipes, and what I have learnt in 35 years of teaching food science and cookery to hordes of under graduates. I do spend a lot of time stirring a bubbling cauldron 🙂 but I like to think that my hats are much more fashionable. Gardening is another hat that I wear. From my early childhood, I was known in my family for my keen interest in food and food preparation and my strong feminist views. I never got bored of watching my mother cut meat or clean fish and I could discern the aroma of the different kinds of foodstuff undergoing transformation during various cooking methods. I was born in Palayamkottai, then a small missionary town in Thirunelveli District in the southern part of Tamil Nadu, India. My family moved to Chennai when I was 10 years old and Chennai has been my home ever since. I came into my own when I was offered admission to the graduate course in Home Science (equivalent to the Home Economics course in the US) at Women’s Christian College, Chennai, which is affiliated to the University of Madras. I was thrilled to learn the science of pre-preparation and cooking of various foodstuffs. I then went on to do my masters in Foods and Nutrition and several years later my doctorate in the same discipline. Meanwhile, I had joined the faculty of Home Science in Women’s Christian College, eventually becoming the Head of the department (which by then was offering two graduate courses, two post-graduate courses, M.Phil. and was also recognized for doctoral research) and later the Chairperson of the Board of Studies for Home Science at the University of Madras. 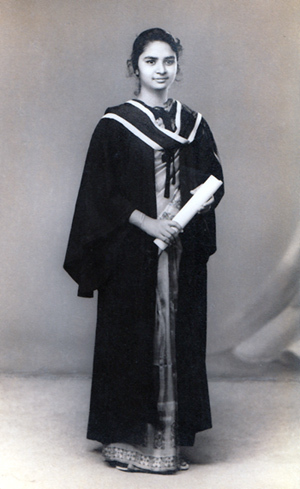 My graduation in the 60s. 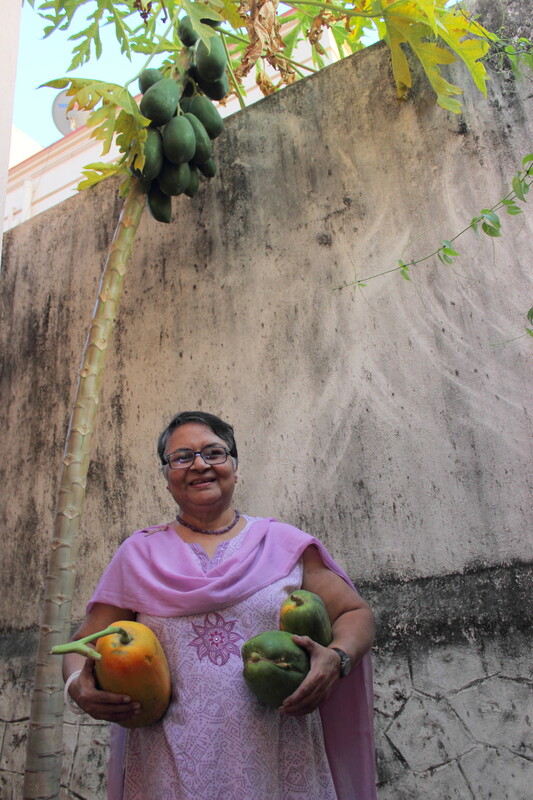 I have taught food science and cookery to legions of young women who joined the graduate courses in Women’s Christian College, Chennai for more than 35 years. 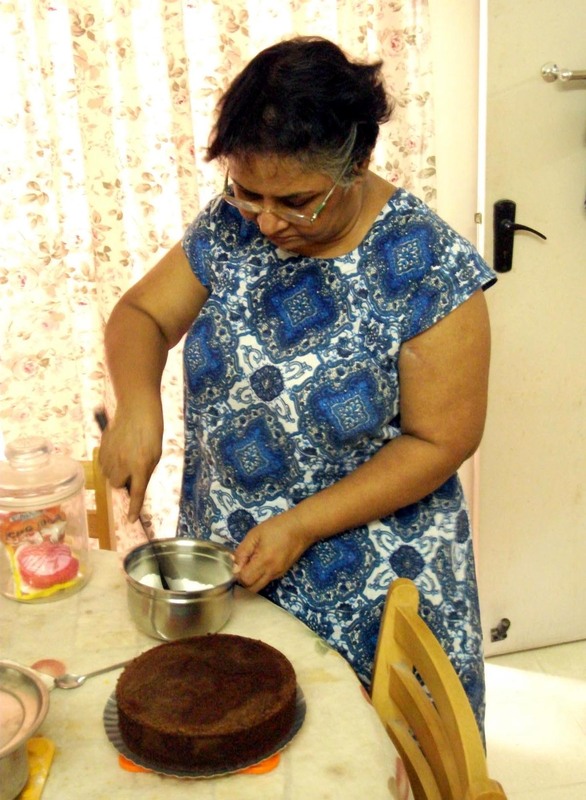 I used to search for recipes which provided variety and introduction to food culture other than South Indian to broaden the minds and palates of my students. I found that many recipes did not list all the ingredients or omitted a vital step in the cooking method. Though I had introduced my own recipes into the curriculum the person who typed it would sometimes change the procedure. 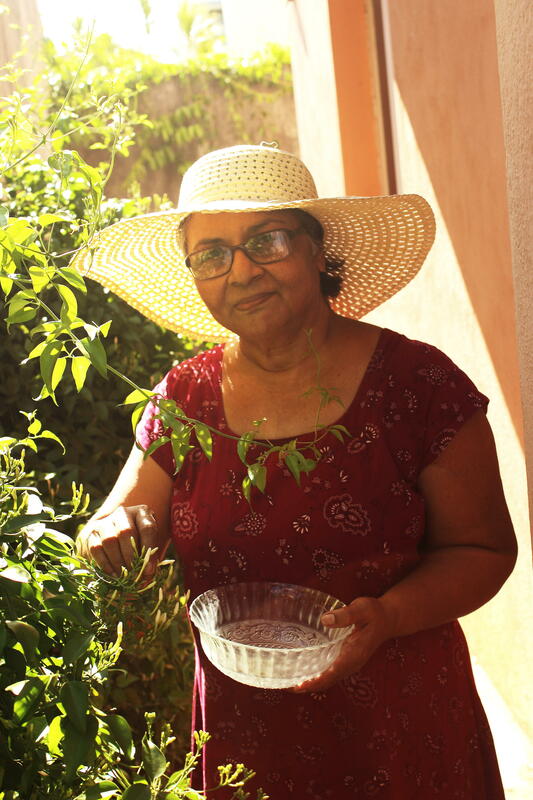 I waited till I retired and then started to work on recipes to make the ingredients accurate and steps in the cooking methods precise, so that even a beginner would make very few mistakes; where necessary, I also considered the limitations in the Indian kitchen and budget. This blog is the fruit of this labour, the 35 years of teaching before it, and the accumulated wisdom of several generations of like-minded women in my family who loved to cook and shared their craft with curious young apprentices like me. I have two grown up children who live with me. My son planted the idea of starting a blog in my mind, and they went on to help me every step of the way. It was my son who suggested the title, and I am very proud of the excellent photographs he’s taken of the dishes. My daughter made me read blogs of others so that I would understand what the mystery is all about. She types my recipes and gives suggestions, and it was she who drew the banner. So it is very much a family undertaking. I am a voracious reader. I am fascinated by automobiles and aircraft. My husband used to prepare bikes and cars for races and rallies, and I used to help him. I am also interested in photography; back in the film days I won a photography contrast with my Zeiss Contaflex. Now, I have a love-hate relationship with the camera in my smart phone. I am also a fairly accomplished seamstress; in the last 30 years I have stitched all the blouses for my sarees. Now I make clothes for my daughter also. I also have green fingers and love gardening. Some of the produce from my garden also finds its way into my kitchen. Ma’am this is so cool……. I have been very happy to find you on Facebook via Dharini s posts (have sent you a request and hope to connect with you) and now very excited to find your blog Kala’s Kalai It is so refreshing to read your style of writing -it transports me to your classes and discussions memories of which I cherish till today & miss. Helo Jayalakshmi, nice get in toch with you.I was very happy to accept your friend request. Mam, you truly are an inspiration, I always think I am extremely busy with two kids and a job. To see you donning so many hats is amazing, I had goosebumps reading. The blog helps me refine my cooking skills. A heartfelt “Thank You” to your children who inspired you to start this blog. Thank you for the wonderful compliments, Kezia 🙂 I enjoy writing this blog and hope you continue to enjoy what I write!